Peaceful but in the centre of the Olang holiday area, the Mutschlechner apartments are the ideal starting point for outdoor pursuits under blue holiday skies. Both summer and winter. People who holiday in Olang have the wonderful natural surroundings of the Kronplatz holiday region right on their doorstep but at the same time they have the advantages of an attractive vacation district with shops, bars and great restaurants. 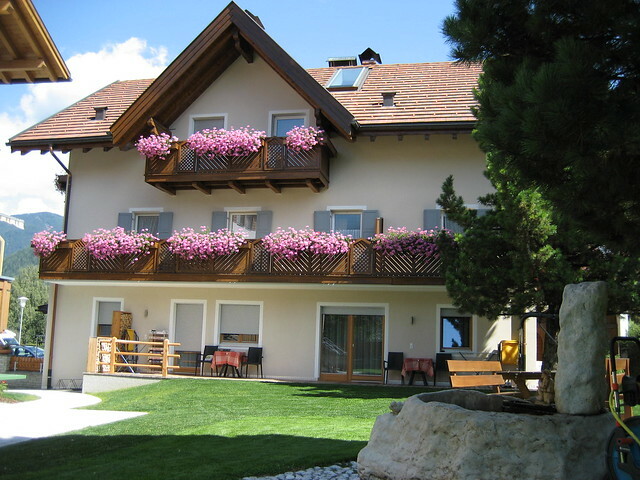 The Mutschlechner apartments offer all this because they are in the heart of Olang, in the sunny Mitterolang and spoil guests, both young and old, with peace and tranquilly. In Winter the skibus, which stops 20 metres from our house, will take you comfortably to the pistes of the Kronplatz, South Tyrol's biggest and varied skiing mountain. No doubt about it: modern lift systems, boundless skiing enjoyment and convivial evenings in the alpine cabins are guaranteed for you and your nearest and dearest when you go snow boarding and skiing in Olang. In summer there are countless trails for the enthusiastic alpinist along which you can discover the unspoilt nature of the Kronplatz holiday area and the enchantingly beautiful Dolomites. Owing to Olang's splendid situation between the natural parks of Fanes-Sennes-Prags and Rieserferner-Ahrn you can choose from a fine selection of mountain hikes and adventurous bike routes that make cycling and hiking in Olang a really special experience for young and old alike.